Following a community consultation exercise held earlier this year, the City of Wolverhampton Council together with Staffordshire County Council has submitted an outline planning application to South Staffordshire Council for a western extension of the i54 development site to provide an additional 24 hectares (60 acres) of land to accommodate up to 100,000m2 of industrial employment floor space. The aerial photo below shows the proposed development site which is located north of Wobaston Road between Pendeford Hall Lane and the i54 site. 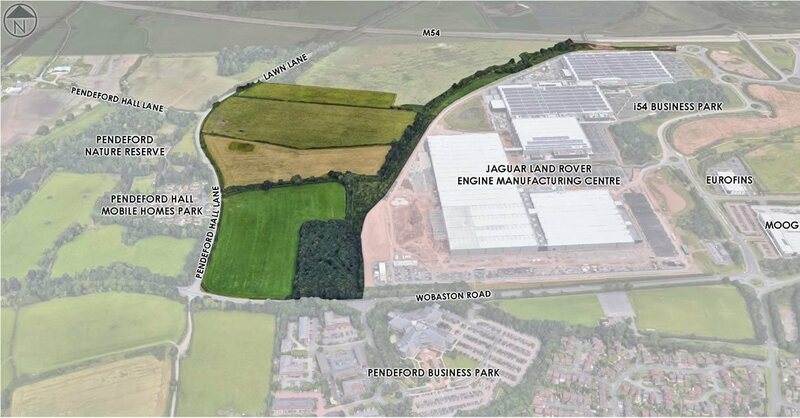 The i54 strategic employment site is now home to Jaguar Land Rover’s new Engine Manufacturing Centre , Moog, ISP and Eurofins. It has recently attracted new occupiers, ERA Home Security who commenced operations at the end of 2017 and Atlas Copco who commenced operations Spring this year . To date over 230,000m2 of new buildings have been occupied and some 2,700 people are employed across the current businesses. It is envisaged that when completed in the coming years, i54 will have provided some 4,600 jobs in total and will have attracted over £1.1billion of private investment. The site continues to be in demand, there is now little land left at i54 to offer to prospective developers and occupiers, who are keen to invest in the area and create jobs. 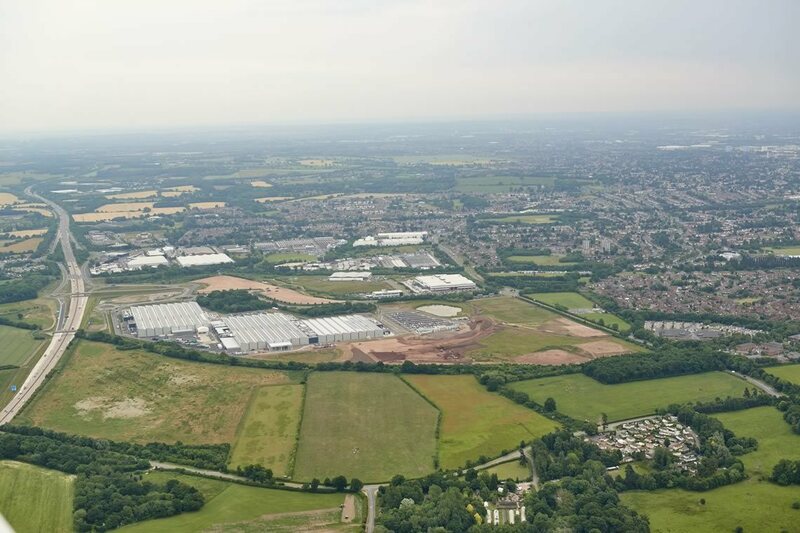 The local planning authority South Staffordshire Council has recognised the need to extend the i54 site westwards by allocating some 40 hectares (100acres) for employment development in its new Local Plan Site Allocations Document. That document has been the subject of extensive consultation and was reviewed at a Public Examination hearing in December 2017, at which the Planning Inspector expressed support for the proposal. It is anticipated that the Local Plan document will be adopted by South Staffordshire Council in August 2018. The proposed i54 western extension land includes, in its southern part, 24 hectares (60 acres) owned by City of Wolverhampton Council. On the basis of this planning policy commitment, the City Council together with its partner Staffordshire County Council (the i54 Development Partners) is intending to bring forward its land to facilitate the development. The i54 Development Partners have appointed an experienced Project Team to draw up the proposed development scheme that is intended to meet potential market demand from prospective occupiers of the new manufacturing industrial buildings and to add to the first class employment area already created at i54. The application site is largely owned by City of Wolverhampton Council and covers an area of approximately 24 hectares, currently used as short term farming tenancies. Land required for the access road linking the application site to the i54 site road is owned by Staffordshire County Council (SCC). The application site is mostly grazing pasture land with a bridleway dividing the two southernmost fields and running along the eastern side of the site. Surrounding the boundary of the application site and separating the fields within are hedgerows, which include the bridleway along the eastern boundary. Over the past five years, the site has been the subject of many surveys by the i54 Development Partners to inform the development proposals. Some of these surveys have been updated recently. These have been used to prepare a site development constraints plan, to appraise the site’s development potential and to provide the basis for the Environmental Impact Assessment. A copy of the Development Constraints Plan can be viewed by clicking here. The application was validated and registered by South Staffordshire Council on the 13th August 2018. It is available to view by going to: https://www.sstaffs.gov.uk/planning/comment-on-planning-applications.cfm You should then click on ‘Planning Documents Viewer’ and insert the reference number 18/00637/OUT to search and view the documents. To make a comment you should instead click on ‘Public Access’ and again insert the reference number 18/00637/OUT to search. You should then click on the tab ‘Comments’ if you wish to make a response. The Site Location Plan shows the application site boundary which includes the access road connecting up with the existing i54 road network. The Development Parameters Plan shows with orange shading the maximum extent of the built development area. This is surrounded by a landscaped ‘green buffer’ zone around the edge of the site. The i54 Development Partners want to maintain the flexibility to respond to multi occupiers or one major investor / occupier. Option A - Single Plot scheme delivering up to 100,000m2. Option B - Multi Plot scheme capable of delivering circa 85,000m2. The multi-plot scheme will depend on occupier demand and plot layouts. The Green Infrastructure Framework shows; retention of part of Shooting Pit Wood, compensatory woodland planting along Wobaston Road, a buffer zone screen along the western boundary comprising bunding, tree planting and attenuation ponds, diversion of Middle Lane bridleway, and retention of hedgerows along the western and southern boundaries of the site. Retention of the section of the Middle Land bridleway passing northeastwards up to the M54 motorway bridge. In early 2018, a community consultation exercise was held involving local residents, businesses, stakeholders and partners. The results of this exercise are presented in the Statement of Community Involvement. A sustainable drainage system including storage ponds is to be provided along the Lawn Lane frontage and this will include small ponds to accommodate the translocation of any amphibians found on the site. The proposed i54 Western Extension can accommodate up to 100,000m2 of industrial manufacturing development and this would create between 1,500 to 1,800 jobs. Modern day manufacturing businesses can provide a range of jobs and require many skills, not only production staff, but also design, research & development, marketing, sales, IT and accountancy. This range of job types can provide job opportunities to the local community. Working with businesses already located on i54, evidence shows that some 49% of the 2,700 jobs live within a 10 mile radius, including Bilbrook, Codsall, Coven & Coven Heath, Featherstone and City of Wolverhampton. The links between businesses on the current site and local recruitment and skills programmes, means local employment is expected to grow. Hundreds of local residents are being equipped to compete for the available jobs through supported employment programmes such as Sector Based Work Academies and other training provision many securing full time employment on i54. Young people from across the city and region have also had the opportunity to experience employment. Over 5,000 pupils and students have participated in a targeted skills and education programmes. It is envisaged that these programmes will continue for the i54 Western Extension (South) development. Alongside the direct employment, there will also be indirect economic benefits in terms of increased spend which local employees then bring to Staffordshire, the Black Country and Wolverhampton, as well as business to business opportunities for local companies providing good and services to the new occupiers. The proposed development is also of national importance by helping to meet demand from international businesses and by raising the profile of other developments in the area. 2021-2025 – Development by occupiers during this period. Comments on the outline planning application can be made direct to South Staffordshire Council as the planning authority. To do this, a link to the Council’s website is provided in the above Planning Applications Submission section.